This inkwell is one of the last examples of inlaid metalwork made in Iran. It was probably used by a high official of the Safavid government. The poems on it include the wish that 'the pen may write the Sultan's official signature with ink from this well’. The inkwell was originally attached to a pen case. Although production of objects of inlaid brass and tinned copper continued, around 1550 a new type of brassware with fine, engraved decoration emerged in Iran. Stylised plants and other ornament were shown in relief against a hatched ground, originally filled with a black compound. The decoration was often arranged in bands or cartouches that matched the shape of the object. Poetic inscriptions in the elegant ‘nasta’liq’ style of Persian calligraphy were also common. Human and animal motifs, absent since before 1400, reappeared. Ink pot with cylindrical base with onion-domed lid, surmounted by a small loop. Pot is engraved with epigraphic friezes around base and top, and both lid and pot are decorated with panels and cartouches containing engraved inscription and geometric designs. Parts of the engraved areas are inlaid with silver. 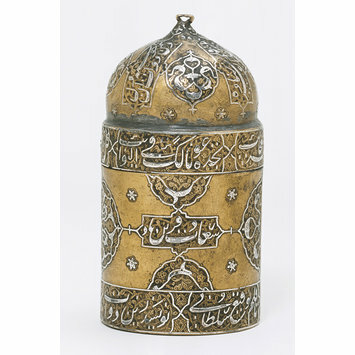 Inkwell with silver inlay, Iran (possibly Tabriz), 1510-1520. A. S. Melikian-Chirvani, Islamic Metalwork from the Iranian World, 8-18th Centuries, London, 1982, pp.283-84, cat. no. 119. This inkwell is one of the last examples of inlaid metalwork made in Iran. It was probably used by a high official of the Safavid government - the poems on it include the wish that, 'the pen may write the Sultan's official signature with ink from this well.' The inkwell was originally attached to a pen case.